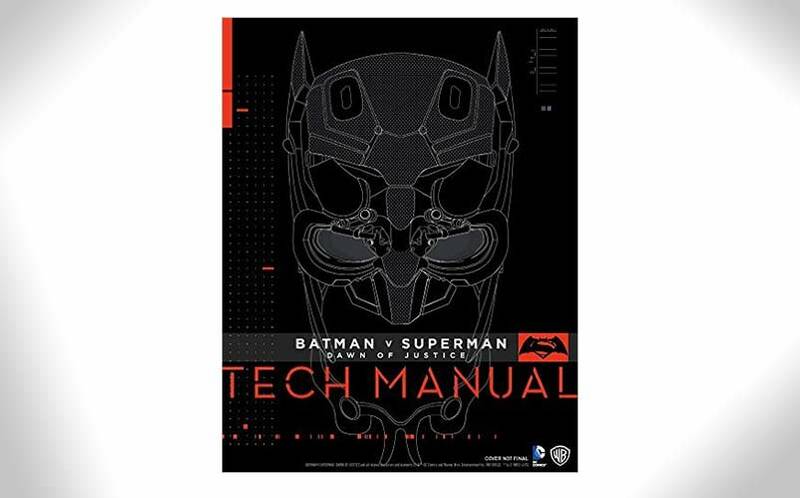 Batman v Superman: Dawn of Justice Tech Manual | Nerd Much? For us, half of the appeal of watching the newer Batman movies is the cool gadgetry and tech toys that the Dark Knight has in his arsenal. hell, every new Batman film even has a short sequence dedicated to Batman’s newest gadgets. Undoubtedly, we’ll see a slew of badass new stuff in the upcoming Batman v Superman: Dawn of Justice movie, too. To coincide with the movie’s release (March 25th for those keeping score at home), authors Adam Newell and Sharon Gosling have put together the Batman V Superman: Dawn of Justice Tech Manual, the definitive guide to the weaponry and props that were created for the movie. The hardcover book takes an exclusive and in-depth look at Batman’s cool weapons, vehicles, Batsuits and the Batcave. The book actually explores the making of the new Batmobile’s design from the very first concept sketch through the detailed blueprints and the actual construction of the vehicle. What’s more, the Batcave is thoroughly combed, and the technology within detailed and discussed. But it’s not all about Batsy, as Superman’s Kryptonian suit and Wonder Woman’s iconic weaponry are also delved into. It’s the perfect primer for the movie, as it comes out three days before the movie’s release. Of course, it makes for a great nerdy coffee table book, too. For more cool nerdy stuff to buy, stay tuned to Nerd Much for daily finds. You can also follow us on Twitter and Instagram for daily updates.